The DEWALT Router is a fantastic tool that will work great for many different wood working situations. It is small and compact to make it easy to use in small spaces, it has a very powerful motor to make routing any material easy, it features a see-through base with LED lights for maximum illumination, and it even comes with a the corresponding plunger tool too. There are many good things to say about this tool and not many bad things so let’s get right to it. Wood routers have been around for a very long time now. Originally they were made as hand crank routers that had no help from electricity. Eventually these routers would become electric and powered by a strong motor. These routers can be sued for a variety of different purposes, but are most often used in woodworking and carpentry, specifically to make cabinets and shelves. 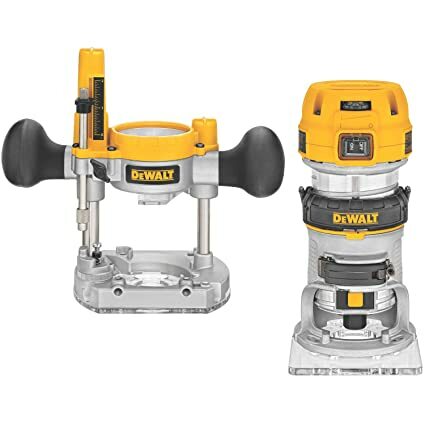 Today we are here to review the DEWALT Max Torque Variable Speed Compact Router Combo Kit so you can make an informed decision and find out everything that you need to know before making a purchase. The Motor – The DEWALT Variable Speed Compact Router features a high power 1.25 horsepower motor designed to work with even the toughest of materials. This router can handle all sorts of materials like soft wood, hard wood, composite wood, plastic, vinyl, and even metal thanks to its high power motor. The Speed – Another great feature that comes with the DEWALT is the adjustable speed setting that lets you change the speed at which the bit moves at in order to maximize its use in terms of materials and applications. The DEWALT has an RPM range from a minimum of 16,000 RPM all the way up to 27,000 RPM to make your life much easier. The Soft Start – This router comes with a great soft start feature that makes the router start out slowly instead of reaching maximum speed right when it is turned on. This makes precision routing much easier due to the controlled speed and the full time electronic speed feedback. This router is smart and is able to control the speed based on the conditions in which you are routing. LEDs – The DEWALT router features a clear base to make sure that you can see what you are doing and to maximize routing accuracy; working blind is no good. To complement the see through base there are also 2 LED lights that light up the work space so you can see exactly what you are doing and where to move on to. Adjustable Bit – This particular model features an easy to use adjustment ring so you can easily change the depth at which the bit drills at. This makes it great for various different applications and for routing at various depths. The adjustment ring lets the user adjust the depth of the bit up to 1/64 of an inch for optimal precision. The Grip – This model of router features a great low contoured grip that is rough and easy to hold on to. This makes precision routing much easier and faster due to increased control and user friendliness. The D shaped base also provides for a lot of stability when routing to make sure that you can make the right cuts the first time around. The Strength – This router features one of the most powerful motors available when it comes to routers and thus it has a very high RPM which makes routing wood and other materials much easier. The Plunger – This particular router comes in combination with a great plunger tool that is also needed in woodworking. Illumination – Another great feature when it comes to the DEWALT is the fact that it has a see through base that is also illuminated by 2 LED lights for optimal clarity, clear sight, and cutting accuracy. Compact – The next really great feature when it comes to this tool is that it is very compact, small, easy to handle, and can be stored in small areas, not to mention that its small size makes it easy to maneuver in various spaces and conditions. Easy Use – The Dewalt is very easy to use, requires no tools to change bits, and features a simple On/Off button for a quick routing experience. Weight – Even though this router is very compact it is in fact quite heavy and it weighs in at just over 8 pounds. So although this router is quite small it is still pretty heavy. Corded – One of the only other drawbacks when it comes to the DEWALT router is that it is corded which means that the user must always be near an electrical outlet to use it. This is a very trustworthy tool for any carpenter to have and it is sure to do the job just fine. It’s small size make using it in small spaces easy, it’s big power make cutting anything a snap, and it’s illuminated base makes for a great vision aid. When it comes to routers there is perhaps no better choice than the DEWALT Max Torque Variable Speed Router.